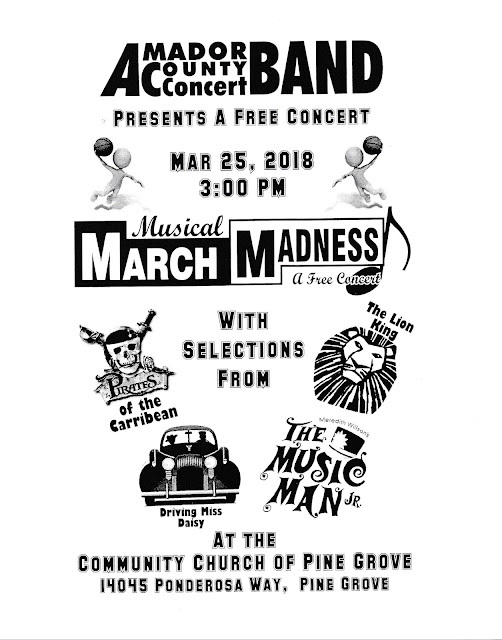 AMADOR COUNTY CONCERT BAND PRESENTS "MARCH MUSICAL MADNESS" - A free concert will be presented by the 45-member Amador County Concert Band under the direction of Steve Chambers on Sunday, March 25th at 3pm. The program will be held at the Community Church of Pine Grove, 14045 Ponderosa Way, Pine Grove. Doors open at 2:30pm. Featured music will be a medley from “The Music Man”, by Meredith Wilson and arranged for concert band by Phillip Lang, “Yakety Sax” by Boots Randolph featuring the entire saxophone section of the band, “A Little Tango Music“ by Adam Gorb, a selection of tunes of the 1920’s in a medley by William Barker called “Tin Pan Alley”, a medley of movie hits by Hans Zimmer, “That Old Hound Dog Rag”, conducted by John Lillie, and more! Join us on March 25th for this wonderful free event. Arrive a few minutes early for best seating….ample parking…music begins promptly at 3pm. Visit the band’s website at www.accband.org for additional information or to find out how to join the band.